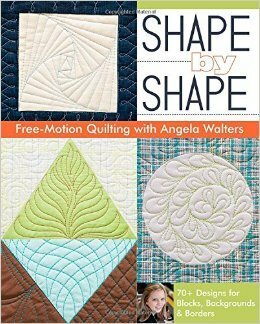 Shape by Shape Free-Motion Quilting with Angela Walters --You will find creative inspiration on every page. User-friendly and visually exciting, the contents are first divided into three sections: Blocks, Negative Space, and Borders. Then, to make it even more accessible, the Blocks section is further organized by five shapes: Squares, Triangles, Circles, Diamonds, and Hexagons. With an illustrated index, 70 free-motion quilting designs, crystal-clear instructions, and gorgeous full-page photographs, this is the go-to resource you’ll want handy before starting any quilting project.